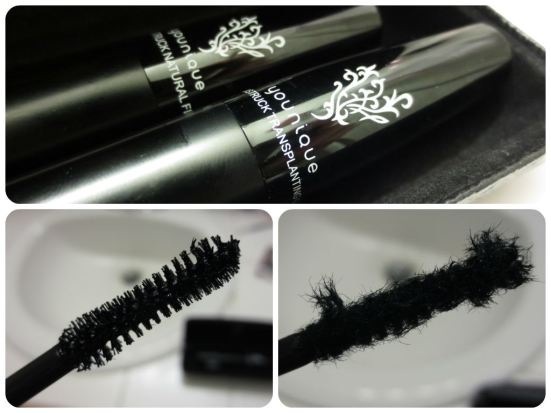 3D Mascara: Yes, It Works! (Long, Dark, Standout Lashes) | mrs. and the misc. There’s not a whole lot to say on this because the photos are far more powerful than any words can be… See below. But it is worth mentioning that I am a known lash coveter. I’ve used Latisse (it works, but slowly); I’ve experimented with expensive lash extensions; and I’ve tried just about every mascara promising “your longest lashes ever.” I’m not easy to impress. So, when my co-worker Rosemary started selling Younique Products and it’s 3D mascara, I asked her if I could try it (always the sceptic). I knew my Arkansas Bride readers would love to know if this “magic” mascara really worked, as it could be an amazing way to get the false lash look for bridals and the wedding day, without having to actually glue on fakies (and without worrying about one falling off!). Rosemary agreed and so here is my official beauty review in pictures! To use the 3D Mascara, you apply one coat regular mascara. This is the mascara I used. Then, using the 3D Mascara, you apply one coat of the gel to one eye, followed quickly by a light dusting of the fibers onto the same eye. Then, apply another layer of the gel to that eye to set the fibers. Repeat the same steps for eye #2. Apply a second (or third) coat of gel and fibers, if desired. Basically you just play with it until you get it down and find the right length and VAVAVOOM for your eyes. This is the 3D mascara: gel and fiber tubes. See it build in this series…. Buy it here now if you want to try!